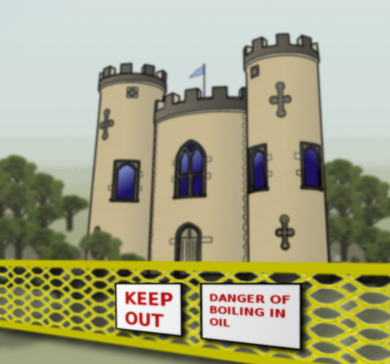 English Heritage has responded to recent vandalism at Shopover Castle in North Yorkshire with new security measures. The castle, which was built shortly after the Norman conquest, was an important stronghold during King John's dispute with the barons. It later played a crucial part in the Wars of the Roses and during the civil war the heavy fortifications presented an impenetrable barrier to the massed ranks of the Roundhead army. In more recent years it has fallen prey to damage by the many school parties that visit the site, so now the massive ten-feet thick walls that have previously proven invincible to cannonball, flaming oil, battering rams and explosives have finally been saved for future generations by the addition of a small yellow plastic fence.